Run #s 3 and 4! I promise I’ll stop numbering them when (if) they start happening on a regular basis, but in the meantime it helps me track how many I’m doing over a period of time. But look! I did two runs within days (not weeks) of each other! Run #3 was on Friday night at a hotel in Portland. We went up to attend the Gathering of the Guilds, a big show/sale of handmade pottery, jewelry, glass art, fiber art, etc etc etc, and decided that 4 hours of driving in one day with two kids under the age of three was a recipe for disaster. So we made a little mini vacation of it and went up Friday, played in the hotel pool (salt water! So lovely) and I got to go run in the fitness room after the girls were asleep. I love treadmills. So even! No rocks or sidewalk cracks to trip over! Such a steady pace! I ran/walked a full 5k (mostly walked). 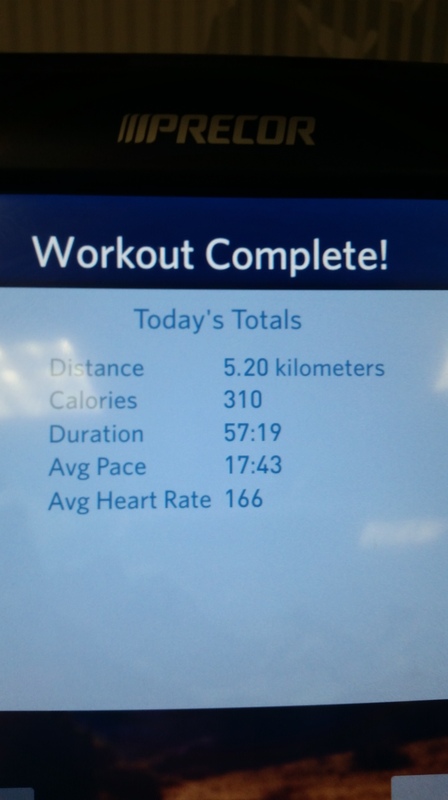 I’m not fast, but I did it! Yesterday at the art show was hilarious since I could barely walk and was in charge of carrying a 22 lb infant. It was fun though! We spent most of our time in the pottery section since Rachel’s mom had a booth there (plus we’re both suckers for pottery), and found the *coolest* travel mugs that are all one piece aside from a cork in the top. We didn’t buy any, but definitely tucked the idea away for later. Run #4 was today. Rachel took both girls into town to attend the flower service at the UU fellowship. I was able to finish up some grading and get out for a run. I forgot to turn on Map My Run again, but I recreated the route when I got home and estimated the time. In roughly 30 (maybe 35) minutes, I ran 2.16 miles. Most of it was actually running, maybe 5ish minutes of walking in there. I was wheezing pretty hard by the time I got home, but U remember from a few summers ago when I was working out regularly how quickly my endurance responded to regular training so I’m hopeful that will be the case this time too. I’m also glad I didn’t let my still-sore legs deter me from getting back out there. Mel Konner writes that when we run regularly, “we feel gradual changes in the body’s shape and weight. We know, too, that there are changes in coordinated patterns of nerve and muscle and in the balance of chemical pathways. Finally, there is mental change: what was painful and exhausting becomes pleasurable though exhausting, partly because of changes in joint, muscle and bone, partly because of endorphin release, and partly because we have gotten into the habit” (Konner 2002, 12). This is my goal.